Barcelona is a thrillingly unique city, home to some of the most famous and bizarre architecture in the world, and the playground of exciting modern artists like Joan Miro, Picasso and, of course, Antonio Gaudi. Travel to Barcelona and you will land in sunny Spain's major holiday city, cosmopolitan and lively, with superb shopping, a great climate, beautiful beaches, a fun nightlife, and plenty of Spanish pizzazz. The city is the gateway to the Costa Brava and Costa Dorada, with their many popular beach resorts, but the interesting sightseeing and the treasures of centuries, not to mention the great restaurants and vivacious locals, will keep visitors happily occupied within the city itself. A visit to Spain is not quite complete without a stroll down the iconic Las Ramblas pedestrian street in Barcelona. It is always the right time to holiday in Barcelona, with its long, hot summers and mild winters. The best months to travel to Barcelona are between June and September, but those who find the heat and crowds taxing should avoid mid-summer (August). Read more on Barcelona's Climate and Weather. -Catch a football match and take a tour at the famous FC Barcelona Museum and Stadium. -Admire the bizarre and beautiful work of Antonio Gaudi at La Sagrada Familia and Guell Park. -Visit the Joan Miro Foundation to see the colourful art of another iconic Catalan artist. -Marvel at the views of Barcelona from the hills of Montjuic and Tibidabo, which boast many other attractions. -Take the kids into the enthralling underwater world of the Barcelona Aquarium. 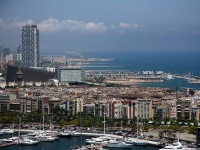 -Enjoy the sun, sand and sea, as well as the festive atmosphere, on Barcelona's beaches. -Explore the Museum of Contemporary Art, a fun, creative space. -Picnic and stroll in the lovely Parc de la Ciutadella in the centre of the city. Many exciting excursions are possible from Barcelona, which is the gateway to the resort destinations of the Costa Brava and Costa Dorada, including the popular Sitges, just a few miles south of the city, and the quaint Tossa de Mar, a short way north. Other wonderful daytrip destinations include the lovely Catalan town of Figueres, the birthplace of Dali; the famous monastery at Montserrat, founded in 1025; and the UNESCO-listed Parque Natural de Bardenas Reales. El Prat Barcelona Airport, situated seven miles (12km) southwest of central Barcelona, is one of the busiest international airports in Spain, with direct flights arriving from numerous cities in the US and UK, as well as Europe. Get more information on Airports in Barcelona. -Barcelona has 12 abandoned metro stations which are said to be haunted and can be explored on ghost tours. -There were no beaches in Barcelona until 1992, when the coastal leisure zone was created for the Olympic Games. -Barcelona's stunning and unique Sagrada Familia Church has taken longer to build than the Great Pyramids! The enchanting city of Barcelona is a visual delight, and has an atmosphere that combines elegance and sophistication with provincial charm. In exploring its streets you'll discover medieval romance in its Gothic quarter and the awe-inspiring delights of the fantastic and sometimes outrageous Art Nouveau architecture of Gaudi and his contemporaries. The funicular up to Tibidabo, or the cable car up Montjuic, both offer breathtaking views over this attractive city. Its skyline is perhaps most famous for Antoni Gaudi's masterwork, the still incomplete church of the Sagrada Familia, as well as the city's huge Gothic cathedral. The artistic legacy of Barcelona is one of the city's most appealing attributes, with museums containing extensive collections of the works of Miro and Picasso. Barcelona is also a shopper's paradise, with the city's flair for style reflected in its numerous boutiques and markets, open late into the evenings. As the sun sets, and the city's many bars and restaurants open, the night truly comes alive. Dinner is served at any time between nine o'clock and midnight, and the festivities around the bars and nightclubs carry on well into the early hours of the morning. Barcelona is the commercial centre of the popular holiday region known as the Costa Brava, the northernmost Mediterranean seafront in Spain, as well as the Costa Dorada to the south. The coast is dotted with popular resort towns, many retaining their age-old charm, which can be easily reached from the city.